5 Must Read Marketing Return On Investment Articles. Click the link below to listen to the podcast. The reason this is a must read is that without going through an article on how to understand and calculate ROI, every other article on this list will be more difficult to understand. The article takes you through how to calculate the ROI of your marketing investments. They give you two credible ways to calculate ROI for your business. The first is simple ROI which is calculated this way: (Sales Growth - Marketing Costs)/ Marketing Costs = ROI. The second way they give to calculate ROI is called campaign attributable ROI which is calculated this way: (Sales Growth - Marketing Costs)/ Marketing Costs - Average Organic Sales Growth = ROI. The article also touches on the challenges that you can face when using ROI to calculate whether or not a marketing venture is working well. It's a great article to start with if you're just learning about ROI for the first time. Click here to read through the rest of the article. This article dives directly into how you can make your business a marketing fuelled machine that consistently achieves a high ROI on its investments. They touch on a number of highly important aspects of effective marketing such as producing content to support your end goals, choosing media methods that produce the highest amount of conversions, developing high-converting "lead magnet" content, and how to manage lead quality. It's a great article for anyone who's looking for a broad idea of how to effectively market their company or use their marketing budget to optimize for the highest return. You can check out the rest of the article by clicking here. Key Information Point From Article: A good marketing ratio is 5:1, being $5 in sales for every $1 in marketing spend, though this doesn't take into account cost of production. This article on webstrategies.com seeks to answer the question, "How do I know if my marketing investments are working?" In this article, they discuss the marketing cost ratio which can be used to understand whether or not a marketing revenue is effective for you. Similar to an ROI calculation, marketing sales ratio is used to represent how much revenue is generated for every dollar spent. How the two are different is that ROI looks at return and net profit delivered from the marketing spend, where as a marketing sales to cost ratio only looks at the revenue before costs delivered from the marketing spend. According to the article, a good marketing ROI is 5:1 and is considered a strong return for many businesses, but your target ratio will vary greatly depending on your industry. This is a ratio based simply on sales, for example if you spend $10 on marketing which results in a sale of $50 you'll have a marketing cost ratio of 5:1 however it doesn't take into account the cost of producing a product or service. While you're selling the item for $50 it may cost $30 to make leaving you with only a $10 surplus. At Profitworks we wouldn't consider the 5:1 ratio a true calculation of ROI but it can still be a good guideline which is why it's considered a good benchmark when not taking cost into account. To continue reading about what makes a good marketing ROI you can click here. 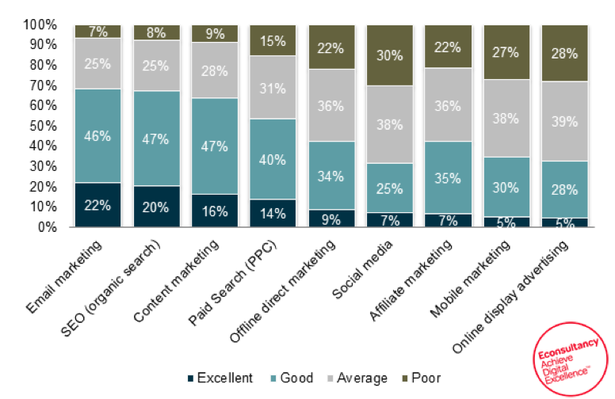 This article on econsultancy.com takes a short but informative look at Email marketing as a valuable source of digital marketing. It claims that email marketing revenues continue to rise despite the fact that many others believe that email marketing is dying as a strong source of revenue for businesses due to the competition of social media, instant messaging and the fear of spam. In fact, it's currently marked as the best channel in terms of ROI with Search Engine Optimization coming in at a close second. It's a great article to help you understand what current digital channels are producing the highest ROI for their clients. Click here to read this article. This is a fantastic article for anyone who is considering diving into SEO as a form of marketing for their business. Many people hope to gain an understanding of what to expect from SEO but as stated by Jayson Demers, "When my clients ask me how they can predictably determine the ROI of their SEO efforts, I wish I could give them a cut and dry answer. The truth is, however, that there is no standard x+y=z when it comes to SEO". Unlike other forms of marketing, SEO works more like the stock market than a slot machine. Rather than pulling a lever and hoping to hit the jackpot somehow SEO is something that grows slowly and often also takes a fall, but with patience, it can be an incredibly high returning investment. If you're considering SEO as a part of your marketing budget be sure to read this article first to have a strong grasp of what to be expecting in terms of ROI within the first few months, and even further down the road. Click here to read this article now.